You understand and agree that there are important risk factors that should be considered by you when deciding whether to purchase products and/or services from Donna Strickland. You recognize and agree that we have made no implications, warranties, promises, suggestions, projections, representations or guarantees whatsoever to you about future prospects or earnings, or that you will will earn any money, with respect to your purchase of products and/or services from Donna Strickland, and that we have not authorized any such projection, promise, or representation by others. The economy, both where you do business, and on a national and even worldwide scale, creates additional uncertainty and economic risk. An economic recession or depression might negatively affect the results produced by products and/or services from Donna Strickland. Internet businesses and earnings derived therefrom, involve unknown risks and are not suitable for everyone. You may not rely on any information presented on the website or otherwise provided by us, unless you do so with the knowledge and understanding that you can experience significant losses (including, but not limited to, the loss of any monies paid to purchase products and/or services from Donna Strickland, and/or any monies spent setting up, operating, and/or marketing products and/or services from Donna Strickland, and further, that you may have no earnings at all (whether monetary or advertising credits, whether convertible to cash or not). Although we believe the price is fair for the value that you receive, you understand and agree that the purchase price for products and/or services from Donna Strickland has been arbitrarily set by us. This price bears no relationship to objective standards. 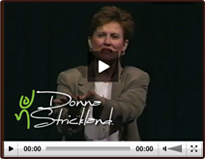 Testimonials and examples on this website about products and/or services from Donna Strickland are exceptional results, do not reflect the typical purchaser’s experience, don’t apply to the average person and are not intended to represent or guarantee that anyone will achieve the same or similar results. Where specific income or earnings (whether monetary or advertising credits, whether convertible to cash or not), figures are used and attributed to a specific individual or business, that individual or business has earned that amount. There is no assurance that you will do as well using the same information or strategies. If you rely on the specific income or earnings figures used, you must accept all the risk of not doing as well. The described experiences are atypical. Your financial results are likely to differ from those described in the testimonials. Please note that the content of this page can change without prior notice. This disclaimer was last updated on 03-15-2012.